« What is meant by international patent PCT? From the point of view of intellectual property, Trademark is all sign with distinctive capacity. Although these signs can relate to the socio-economic reality of a particular place, globalization made it possible to brands to achieve ever more assert itself globally. It may be a “pipe” for sportswear brand, an “M” distinguishable by its form or the characteristic of the yellow colour of the packaging of a chocolate. In this way, the marks distinguished products and services both in the country of origin and in all those countries in which the brand is present. Well, emerging brands and start-ups should have their protection, since it gives you a product or service the added value that ensures that no one except the owner may use that name for a period of 10 years which may be renewed in periods of 10 years proving the use of such trademarks. Gatti & Asociados manages the full process of patents, industrial designs, utility models, trademarks and copyrights in Argentina and abroad, from beginning to end. An extensive background and experience have given us specialized knowledge about every aspect involved in the processes of drafting, preparation, processing and protection, and we advise our clients accordingly. Members of the firm participate in various conferences and intellectual property seminars, national and international, and thus are always connected with new global trends in this field so how are also interrelated with colleagues around the world to expand the networks of contacts. 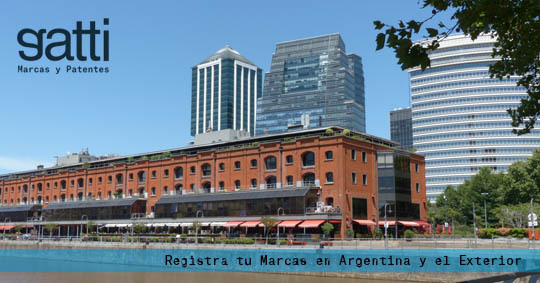 The registration of a trademark in Argentina only applies to our country. The registration of a mark has local coverage. IE that the same protection is covered in the country in which the procedure is made. So that when a company makes the decision to market its products abroad they should register and protect the trademark in the country of destination. As an example of what can happen, we encountered the case of Apple. The company had to pay U$ S 60 million to the Asian company Proview Technology, to end the dispute on the trademark iPad, which prevented the signing of Steve Jobs to use it in China. The judicial battle, of extensive data, delayed the launch of the new iPad in the Asian country, a business major obstacle if you consider that Apple dominates 70% of the market of tablets there. That is why when you want to export, in a project budget the costs necessary for the protection of trademarks should be included in the country of destination. This should be run before entering any market. The risk of enter and not have trademarks abroad could cause large losses of money and time with the aggravating circumstance to stop all operations including the risk of being exposed to very high cost trials abroad. Gatti offers a solution centrally through a system that has developed over the years called GLOBAL IP Solutions. This system allows to carry out jointly the registration of the trademark that you want to protect in several countries jointly. With this system customer saves time and procedures and at the same time money since our office deals with the entire process working dynamically with a network of colleagues associated throughout the world. Do not hesitate to contact us! We offer new solutions for new global challenges.